Home PREGNANCY STAGES What Happens During Embryonic Development? What Happens During Embryonic Development? The embryonic development lasts for 46 days, and during this time the little one could grow one inch in length. At the end of this period the majority of the internal organs of the baby will be already functional and the appearance of the baby will be something like the look of a real baby. The embryo is nourished in the womb and it gets the oxygen from the placenta. The waste products are released through the umbilical cord that is connected to the placenta. The cord comes with three blood vessels through which the circulation of the baby occurs. For the development of the embryo the placenta, that can be found in the uterus, is very important. We can say that it is something like a two-way filter between the blood of the baby and of the mother. This is what makes it possible for the mother to perform the life functions of the little one. As it has been mentioned before regarding the embryonic development, the placenta is where the baby releases the waste materials, including carbon dioxide. These waste materials are later absorbed by the bloodstream of the mother. On the other hand, the little one gets fresh nutrients, oxygen and blood from the mother. In the same time, you should know regarding the development of the embryo that the placenta is working as a permeable screen that is meant to keep out the majority of the toxins, since it can’t keep them all out. This means that the baby gets only those molecules that are small enough to fit through the placenta. As the embryonic development goes on, the placenta will become a kind of protective membrane. At the end of the 8th week of pregnancy the baby is entirely surrounded by it. The amniotic fluid found inside this membrane protects the baby when the mother moves or when accidents happen to her. 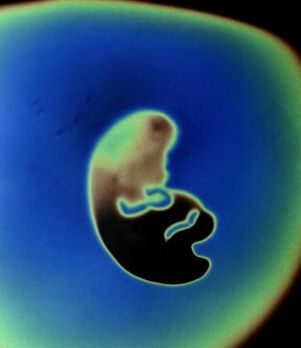 During the development of the embryo, the cells get differentiated. The outer layers will become the skin, sensory cells which will also form the nervous system. The inner layer will make up the lungs, digestive system and also the thyroid gland. It is interesting to know that at the end of the third week of the embryonic development, the heart of the little one is already beating, and the nervous system is taking shape. At the end of the fourth week the legs get curled up and the eyes also appear in the shape of dark spots. Later during the development of the embryo the legs and arms will get more accentuated and at the end of the 8th week all the major organs will have already formed: the liver starts producing the blood cells and the kidneys clean the waste products. The physical embryonic development is also visible, since the little one already has a mouth, nose and eyes, not to mention the toes and fingers.